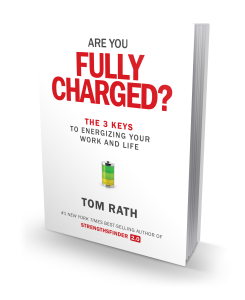 Tom Rath, author of six influential bestsellers, reveals the three keys that matter most for our daily health and well-being, as well as our engagement in our work. Drawing on the latest and most practical research from health, psychology, and economics, this book focuses on changes we can make to create better days for ourselves and others. Are You Fully Charged? will challenge you to stop pursuing happiness and start creating meaning instead, lead you to rethink your daily interactions with the people who matter most, and show you how to put your own health first in order to be your best every day. This book is part of a new series from #1 New York Times best-selling author Tom Rath that challenges people to rethink what’s most important for their work and well-being. The series includes a feature-length movie, interviews with top social scientists, a new children’s book, an app, and a website ﬁlled with resources for improving well-being.